*If you're one of my players, stop reading now. Over the summer, I left D&D behind to start a Call of Cthulhu campaign. Strangely, prior to this, I had never played the game before, despite having devoured all the Lovecraft I could find as an adolescent and having done a heck of a lot of roleplaying. I had a strong desire to rectify this terrible deficiency in my later years. What pushed me over the edge was reading Robin Law's brilliant Trail of Cthulhu campaign, The Armitage Files. At its heart, the Armitage Files consists of a series of 10 documents. Their apparent author is the chief librarian of the Orne Library at Miskatonic University, Henry Armitage of "The Dunwich Horror" fame. The first document presents itself as a desperate missive from the future, sent back to his earlier self from a point in time after Armitage failed to prevent the Old Ones from awakening. Having watched the towers of New York sink beneath the waves, Armitage is now fleeing in upstate New York from "the things that stole his face". The writing is disjointed, and in parts, seemingly mad. He refers to the "Moebius Wasps" that have colonized his mind, and stresses that the documents written earlier should be trusted more than the documents written later. The other nine documents, which arrive slowly over time, are apparently drawn from Armitage's notebooks, written (mostly) before the Cthulhu Apocalypse, case notes from his ultimately failed investigations. Each document introduces a large number of hooks for a desperate sandbox campaign. I am one of the (lucky?) gamers who is capable of feeling fear when reading horror, and I am happy to report that these documents, especially the first, but also certain sublime later ones, scared me. I knew right away that as an open ended sandbox the Armitage Files was too much for me to handle without some experience running Call of Cthulhu. Also, the documents presuppose that the investigators are in some way linked to Armitage. Drawing on one of the campaign settings presented in Trail of Cthulhu ("The Armitage Inquiry"), it suggests that the players might be members of a secret society put together by Armitage and other professors at Miskatonic University to investigate mythos phenomena. I like the idea of the secret society, but it didn't seem like a good starting place. I wanted the quintessential Call of Cthulhu experience, where the investigators start as ordinary people with no knowledge of the mythos and slowly acquire, at great cost, a dim vision of the horrors that surround them. Seen in this light, beginning as a member of the Armitage Inquiry is a shortcut: you start as part of a secret organization, in control of the Necronomicon, whose members have had a good bit of mythos experience. So I also wanted a way to slowly introduce Armitage and the Inquiry, and to set the stage for the delivery of the Armitage Files into the laps of the investigators with as big a punch as possible. For these reasons, I set about cooking up a scenario of my own, something more manageable that would introduce the world of the Armitage Files. My group is now 8 sessions in to that scenario. The year is 1935. The scenario is split between depression era Arkham, Massachusetts and Block Island, Rhode Island. Working up Block Island as a setting for Call of Cthulhu has been unusual good fun. I've been to Block Island twice, once on my impromptu honeymoon. I am fond of the place, and I had an experience there that was eerie enough to have stayed with me through the years. (I'll talk about that another time.) It's been great fun to learn about the history of the island, and to weave it together into sinister layers--Native American, Colonial, 19th Century--with a delicious mix of the real and the imagined. It's also given me the opportunity to delve into the beliefs of strange Christian sects, since on my Block Island there is a Shaker village, a heretical offshoot of the Harvard Community. This has allowed me to introduce theological disputes and occult texts. I'll be posting about all this in the weeks to come. So I started a Call of Cthulhu Campaign with Chicago area folks I (mostly) met on G+. I ran it all summer with a hiatus around the birth of my daughter Maddy. One player left town at the end of August, but we're still going. Here's the thing. My work is demanding, I have two kids, and I game about once a week. The result is that I'm only able to produce content that I make for actual play. If I'm going to post anything to this blog in the near future, it's going to have to be Call of Cthulhu. This is a change of identity for the blog. 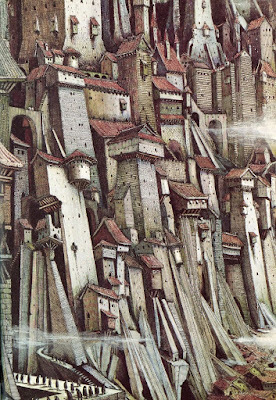 When I get back to dungeon mastering D&D around February or March, I'll return to Ruined Ghinor. Right now, my head is in New England of the 1930s. 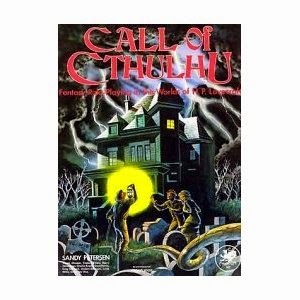 I'm crazy for Call of Cthulhu. I regret nothing. Chafing at the rigors of the Scarlet Censors in Rastingdrung, this youth gave up his life as an apprentice carver to seek his fortune beyond the city's walls. He is on the verge of starving, with hollow eyes and sunken cheeks. 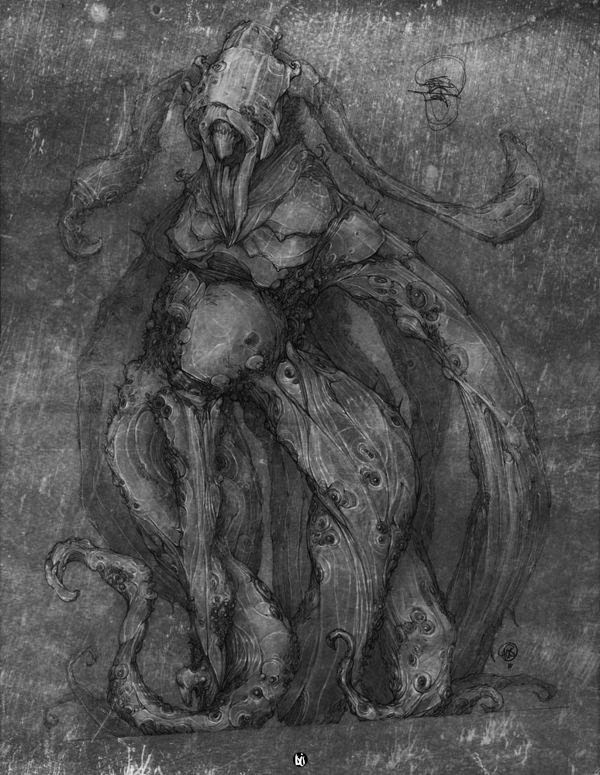 A fanatical devotee of Manannan, Voldar believes with all his heart that the true home of man is beneath the waves. Although he believes that your plan is mad, he views the opportunity as a gift from his god that he dares not decline. This greying ruffian of dubious morals has a scar around his neck from a near miss with the gallows. A long career of thieving has netted him little, and he wishes to risk everything on a final gamble. We will be using these house rules for underwater exploration. *This pertains to my upcoming flailsnails game exploring the Submerged Spire of Sarpedon the Shaper at 9pm-12 Sunday 9/7. There are still a couple of slots open. Leave a comment if you're interested and haven't read through the dungeon. I'll send you the invite.